The Holiday Inn Express, Washington, DC N Silver Spring serves as a true gateway to Washington, DC. 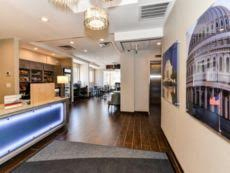 Our hotel offers many amenities for the Embassy traveler and our location on Georgia Avenue places you with easy access to Embassy Row, the White House, Museums, City Place Mall, the Library of Congress and many other local attractions by car or Metro. We will be happy to provide a complimentary shuttle service to the Metro Station for any of our hotel guests. Start your day with our complimentary Express Start Breakfast Bar, newspaper and hot-freshly brewed coffee. Whether in town for business or pleasure, our hotel will allow you to stay in comfort with many amenities, to include a refrigerator and microwave in every guest room; Safe deposit boxes, Self or Valet Parking, 24-hour fitness Room, lobby market place and on-site laundry facilities. The hotel offers many room types to fit any traveler's needs including Kings and Doubles. Contact our Sales Office for long term or group rates.